Q. Was the Brooklyn Flint Glass Company an ancestor of Corning Incorporated? Image: Brooklyn Flint-Glass Works New York. John L. Gilliland & Co. James Smillie, engraver. 1852. Rakow Research LIbrary Bib ID: 705090. 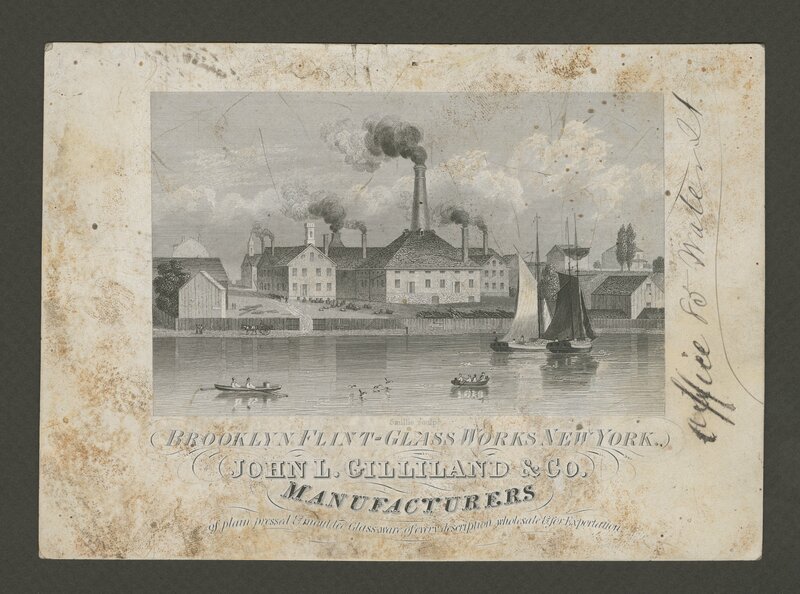 In 1823 John Gilliland founded a glass company that came to be known as the Brooklyn Flint Glass Works. The company made cut, pressed, and household glassware. Amory Houghton, Sr., purchased the Glass Works in 1864. In 1868, Houghton moved his company to Corning and re-named it the Corning Flint Glass Works. In 1875, the company re-organized and became Corning Glass Works under which name it remained in operation until 1989 when it became Corning Incorporated. Amory Houghton, Sr., was already involved in the glass industry prior to the purchase of Brooklyn Flint Glass Works in 1864, as he served on the Board of Directors of Bay State Glass Works in Cambridge, MA, and was one of the principals of Union Glass Co. in Somerville, MA. The Rakow Research Library guide on Corning, New York: The Crystal City includes a page on the Brooklyn Flint Glass Works and one on the Houghton family, if you would like more information. The guide suggests books and articles that discuss the Brooklyn Flint Glass Works and the history of Corning Incorporated. Please let us know if there is anything specific that we could assist you in finding. the address of Brooklyn Flint Glassworks? I can't find the connections as to when and how Corning Glass ended up in NY? Is the Corning Museum of Glass dedicated to the Corning family?